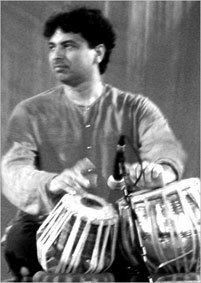 Sarvar Sabri is an internationally renowned tabla player / composer whose versatility, and passion for the rich diversity of the world's musical traditions, has spurred him to constantly experiment with other world-class musicians and composers, and to extend the boundaries of his own classical form. Sabri is proficient not only as a soloist but also works with many Indian classical vocalists, instrumentalists and Kathak dancers. His strength and distinguishing feature is his versatility, he is able to accompany a range of artforms, showing awareness and sensitivity to the different styles required. He regularly participates in major music festivals held in India. He makes regular appearances at the South Bank, London and has also performed for the BBC, ITV and Channel 4 including the South Bank Show. He also appeared BBC Live 2000 at the International Convention Centre (Birmingham) for a concert organised by the BBC to celebrate the millennium. As well as Indian classical music, Sabri has also been involved with experimental work. As a soloist, he has worked with the BCMG in collaboration with composer Judith Weir, Bournemouth Sinfonietta, East of England Orchestra and Sinfonia Baltica. In 2006, he appeared with CBSO and in March 2007, he worked with Viva Sinfonia (Derby) on a collaborative project with the orchestra. He is the founder of the Sabri Ensemble, which is a Birmingham-based group dedicated to exploring the richness of different musical traditions and styles. The Ensemble creates music taking inspiration from the Indian, Latin American, Afro-Caribbean, Jazz and Western classical traditions, exploring new sounds and techniques. Sabri regularly leads various educational projects involving children of differing age groups and abilities. He conducted many projects at the Symphony Hall, Birmingham, involving children with severe learning difficulties. Although currently based in Birmingham, where he teaches at the Birmingham Conservatoire, he continues to tour world wide. Sabri’s work can be heard on numerous cds playing with some of the world’s finest musicians.